Sunday was a great GA day for me. It started off as a Pilots and Paws rescue flight for a one-eyed cat named Gio. 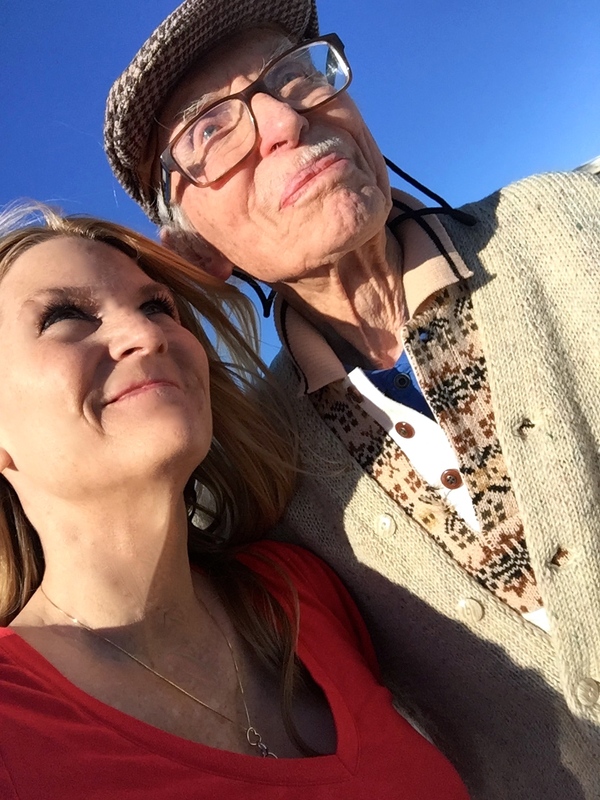 Since I was headed up to the San Francisco Bay Area, I thought I would contact my 96 year-old pen pal/friend William Mason [Army Air Corps Flight Instructor at Rankin Field [Tulare, CA] with my Dad, and brother to uber famous Sammy Mason] to see if we could meet up for a burger at the 29er Diner. The combination of a charity flight, using a friendly small airport and meeting with a WWII aviator makes for a perfect GA day. 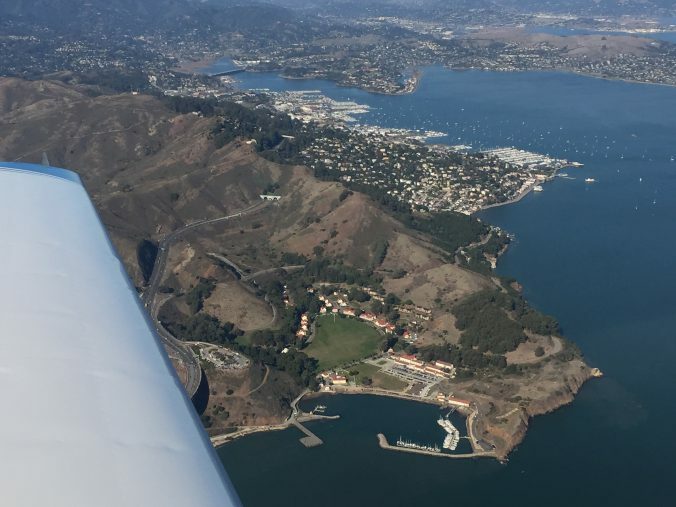 Originally Pilots and Paws had requested Santa Rosa Airport, which is a wonderful larger airport, but, as anyone who has flown with me to Oshkosh knows, I love to go to small GA airports and support more “mom and pop” FBOs. So I asked for Petaluma and received that as a final destination. I got my taxi clearance and asked tower for my IFR clearance to Petaluma. The next bit of news was not so happy “6619U I have no IFR flight plan for you in the system.” Drat! I mentioned that I had even gotten an email confirmation. Hmmm. I let the lovely tower folks [really they are, no sarcasm there] know when I was done taxiing I would figure it out. Figure it out I did. Guess who filed the plan for a WEEK from today? Me, yup me. Duh. Luckily I had the routing, so no worries, got it put into the system. I departed on the obstacle departure procedure and up to the Bay Area. The smoke was maybe 800 feet above ground level… maybe. I was in the smoke, I mean in the smoke. Could not see anything, nothing but white. “Okay sister, this is what you are trained for, instrument scan, track the course, you can do this. Probably won’t be but a minute or two.” Yeah—no. 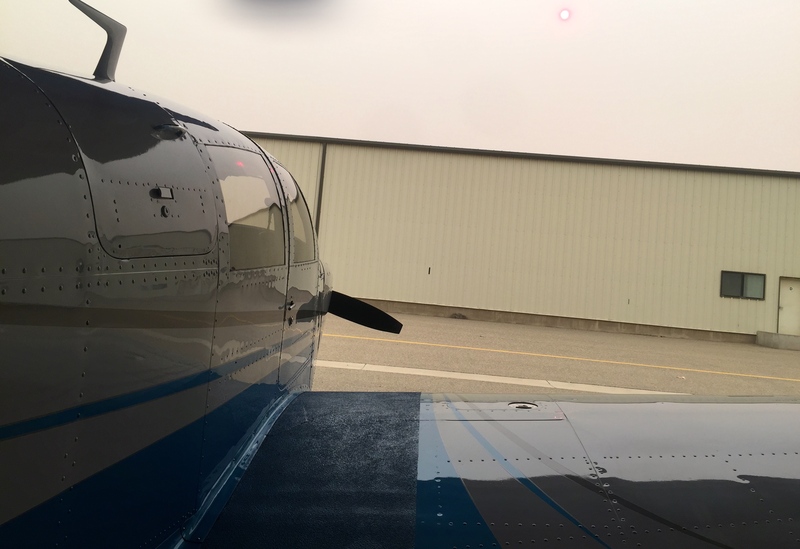 Just under thirty minutes later I come out of the smoke right over the Paso Robles airport. I knew that my VOR tracking was not the best while in the smoke. I was disappointed that I sort of got flustered but I was able to just regain my composure and soldier on. I flew up the Pacific coast and the CAVU day was spectacular. ATC was super busy and very helpful. 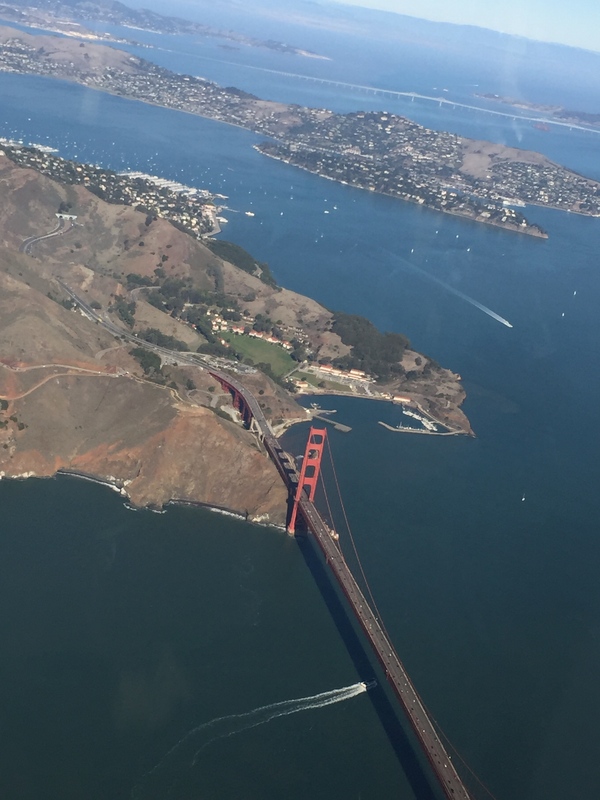 I asked for the Bay Tour [as did about a hundred others] and was grinning ear to ear flying over the Golden Gate Bridge, Alcatraz, Angel Island and the San Francisco bay. After the tour and the photos, I turned to Petaluma [O69]. There were six other airplanes in the pattern at O69/Petaluma. There were a few students working the pattern, a Waco buzzing around, two helicopters practicing taxiing, and even another Mooney landing right before me. The fuel price is one of the best in the Bay Area/wine country. I taxied to a transient tie down and then struggled a bit to push Maggie back into the spot. Before I knew it a local named John was there asking if I needed a hand, which I gladly accepted. We got on the waiting list for indoor seating at the 29er Diner and the next few hours were spent with Bill and his daughter. We got to enjoy a great lunch, catch up, talk about aviation and some of his glory days. Bill owned a Stearman for many years, which he flew across country with his wife. When it was time to leave I made sure to check the date and time on my flight plan and hit “File”— voila it went through. I did get vectored in a way from ATC that reminded me of an old high school cheer “lean to the left, lean to the right, stand up, sit down, fight, fight, fight.” The routing on the way home was offshore quite a bit. I don’t know about anyone else, but I swear I hear every single engine hiccup when I am over water. On the way home I was at 9000, and got a beautiful and enduring view of the sunset off my right side. I knew that the smoke would be formidable on the approach into the Central Coast. I descended down from 9000 to 8000, then down to 5000. Under the smoke it was black as night. I requested a precision approach from ATC. I thought it best to fly an approach I had practiced many times that took me right to runway 12. Between the black of night, and the ash build up on the windscreen, and the general haziness from the smoke, the approach was challenging. I did have a little bit of an optical illusion just above the aim point. 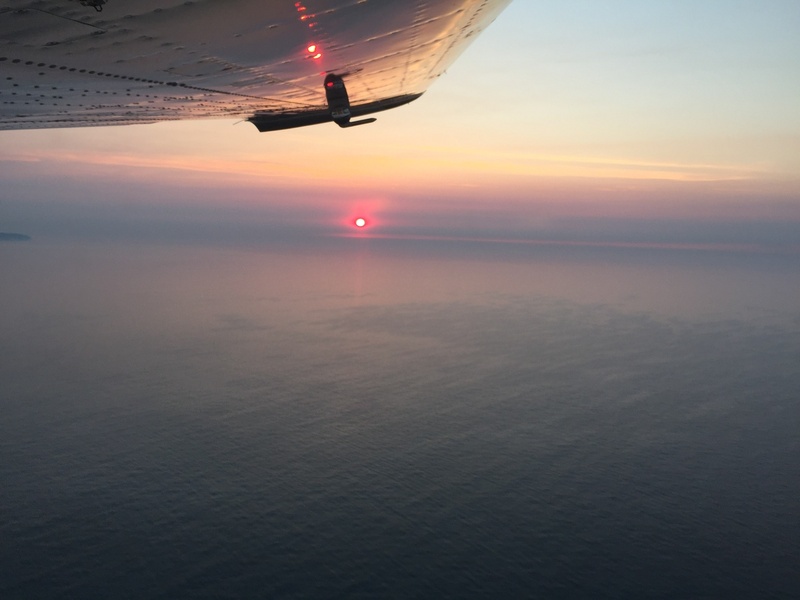 It was hard for me to tell how high I was above the runway to begin the flare. I should have maybe looked out the left window, but I didn’t. Landing was rock star– which is so wonderful. All in all I had an hour of actual. 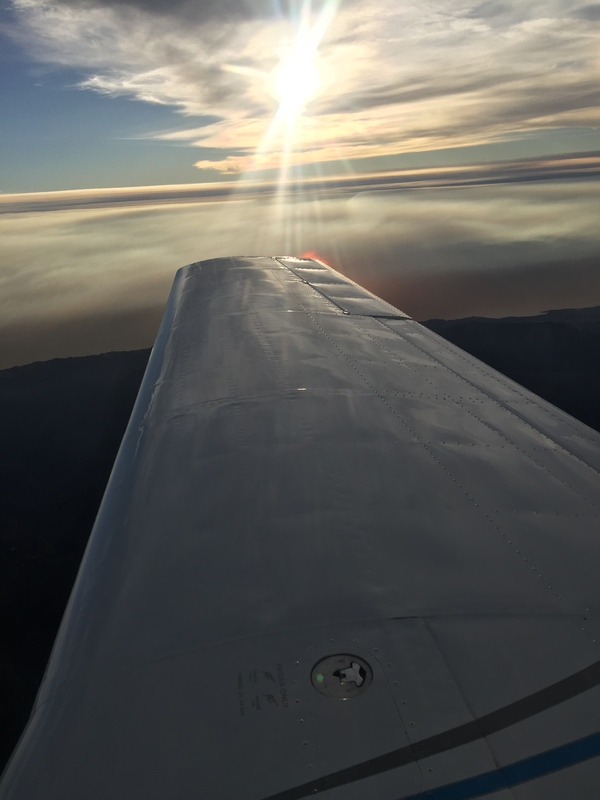 We are so fortunate to have many ways to give back in service to others with our airplanes and airports. I try to remember all these aspects when I am planning a trip. Am I flying an empty airplane? Is that the best use of the space? Perhaps there is someone who would like to come along, or better yet a Pilot n Paws, Angel Flight, LightHawk or other charitable cause. What is your destination airport? Where will you be spending your dollars for fuel, lodging and food? The day cost me a couple hundred dollars in fuel. I look at this as money spent buying memories. That is really money well spent. I have the memory of my first flight into IMC, connecting with a WWII aviator, of wanting to help a little one-eyed kitty and of course being part of a great big GA family. As this year comes to a close it is a good time to reflect on the past and look toward the New Year. Maybe 2018 will be the year you add that endorsement, or get your instrument rating, or get serious about buying into a club, or donate your time in service to others. I’ve always thought that flying through smoke is a very bad idea. If you do, you are breathing whatever burned to make that smoke. Here in California, that almost certainly means poison oak, but there are dozens of other poisonous plants from Azaleas to Wisteria that could also be rising as ash. When man-made materials are buring, there are probably chemicals included in the fuel. Not only is breathing smoke probably bad for your health, what if you breathe something that causes a severe allergic reaction? Is it possible that it could incapacitate you? I’d rather go around or even scrub the flight. Next time you are up in this part of the state, have a look at the very north end of the peninsula outboard of Tomales Bay. Even from 1000’ you should be able to spot the Tule Elk. By the way, did you have the Blueberry Coffee Cake at the 29r Diner ? One time I asked if I could buy an entire cake to take home with me. The gal smiled politely and replied NO ! Other customers later on would be disappointed. Thanks for your comment! I did not have the blueberry coffee cake, but will do next time! Great story. Thanks! 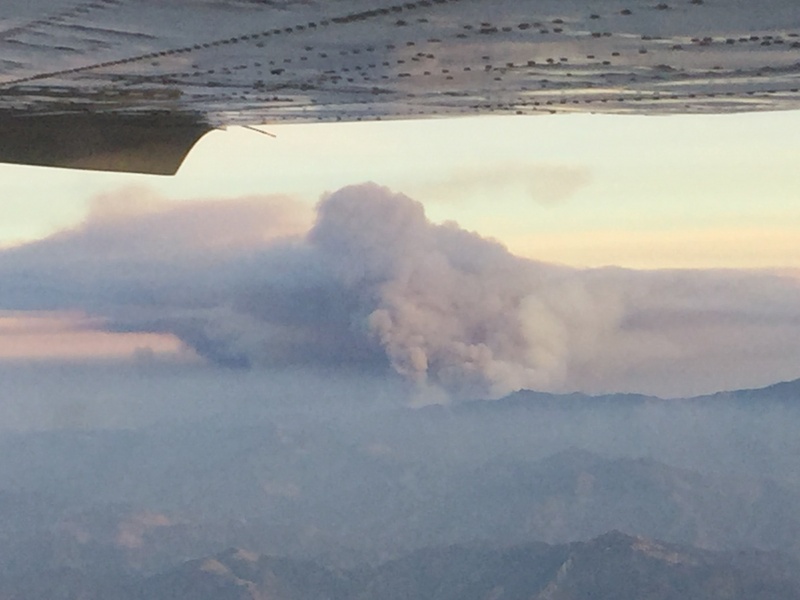 I also conducted an IFR Flight into Santa Barbara December 15th while the Thomas Fire was burning. Mine was prior to dawn so it was pitch black except for the bright red flames seen occasionally through the smoke on the west side of the TFR. I had my dust mask at the ready but didn’t need it. Beautiful sunrise through the smoke taking off again. Later in the day my second https://uploads.disquscdn.com/images/8e9a26645951eaa9d98b5a991855308f0c76f8cd043179ef481f93889e19d4f7.jpg https://uploads.disquscdn.com/images/d9ed1ff67d8ef084270ea1e7aa41cdf7bae3f8290abd1c97df6b1956efa9bf91.jpg flight out had a spectacular view of the fire. And I thought it might be just me who has that feeling like that right seat (at least!) should be occupied when I go up.